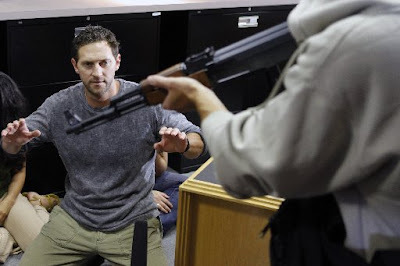 Former Navy SEAL Cade Courtley is hosts “Surviving Disaster” new series. This new TV series was premiered on yesterday, September 1st, 2009 with an episode dedicated to a plane hijacking. He will be facing danger imminent for conducting secret missions from the sea, fire, land and air that include counter-terrorism operations. This series produced by Shed Media US and directed by Mark Lewis. This season’s other episode will also including danger shot such as, nuclear attack, avalanche, cyclone, Bio-Chemical Attack, Earthquake, Mall shooting, Home Invasion, and Lost at Sea. The first episode was aired on Tuesday, September 1, 2009 at 10:00 PM on Spike TV with title, “Pilot:Hijack”. In this episode dispense advice before trying to ram through the cockpit door and grab the hijacker by the throat. Cade Courtley told directly to the audience and guides them one by one steps process to only Survive Disaster, with dangerous obstacles that may occur within each catastrophic event. His strong shot has given to in military Special Operations in the unmatched skills to survive and adapt in the direst of circumstances.